The Charleston Bending Brace brace (figure 3.9) was introduced in 1978 as a night-time brace for the treatment of idiopathic scoliosis. This brace is indicated for patients who present with idiopathic scoliosis and are skeletally immature (normally Risser 0 through 3) and with a coronal plane Cobb angle of 20 to 35 degrees (Reed and Price, 2002). The objective of the Charleston Bending brace is to biomechanically correct the scoliosis via stabilising, lateral shift and unbending forces (3-point pressure systems). The patient's scoliotic curve is classified according to the classification of King. As a result, the patient's brace type is designed according to the classification of curve. The classification of King, reported by King et al., (1983) distinguishes five different curve patterns or types (King type I through King type V) in a series of 405 patients, miscellaneous types were presented in four of 405 patients (Table 2.3). The King type is based on the clinical appearance and radiographic evaluation (Winter and Denis, 1994). The King type pattern is mainly classified by the characteristics of the coronal plane curve in reference to the midline. When using the classification of King, the midline refers a vertical line taken from the midline of the vertebral column, in which S1 or L5 is utilised at the centre of the pelvis. A S-shaped curve in which both the thoracic and lumbar curves cross the midline. The magnitude of the Cobb angle of the lumbar curve is larger than that of the thoracic curve on standing roentgenogram. Both curves are structural, with nearly equal flexibility. A S-shaped curve in which both the thoracic and lumbar curves cross the midline. The magnitude of the Cobb angle of the thoracic curve is larger than that of the lumbar curve on standing roentgenogram. The lumbar curve is more flexible. A thoracic curve in which the lumbar curve does not cross the midline (so-called overhang). A long thoracic curve in which L5 is centered over the sacrum, but L4 tilts into the long thoracic curve. A double thoracic curve with T1 tilted into concavity of upper curve. The upper curve is structural on side bending. Table 2.3 King type I through King type V (King et al., 1983). The design of the Charleston Bending brace is completed individually for each King type. In the King type I scoliosis the lumbar pelvic relation (LPR) of L3, L4 and L5 are measured (figure 3.10) The LPR is measured by drawing a line which is horizontal to the inferior vertebra end and another line which is horizontal to the iliac crests. The LPA is measured from the point where these lines intersect. In the case that the LPR is greater than 15 degrees, a lift must be added to rise the pelvis of the concave side of the lumbar curve. As a result, this would align the vertebral column in the lumbar region. The vertebra tilt angle is measured by drawing a line which is horizontal to the inferior vertebra end and another line which is vertical to the sacrum. The VTA is measured form the point where these lines intersect (Reed and Price, 2002). Figure 3.10 King type I pattern is represented in the figure. The lumbar pelvic angle and vertebra tilt angle are represented in the figure as LPA and VTA. 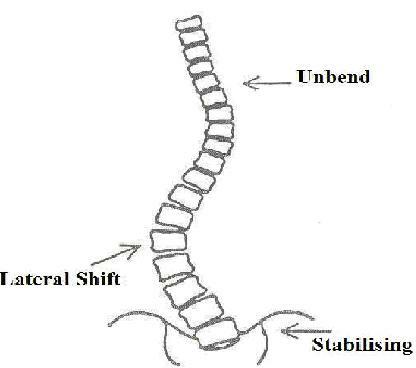 The lumbar curve has a greater magnitude of Cobb angle than the thoracic curve. Lines are drawn horizontally from the vertebra ends of the lower lumbar region. 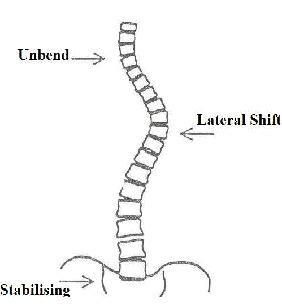 A stabilising force must be applied on the concave side of the lumbar curve. Subsequently, the lateral shift force is applied to the apex of the lumbar curve (figure 3.11a). 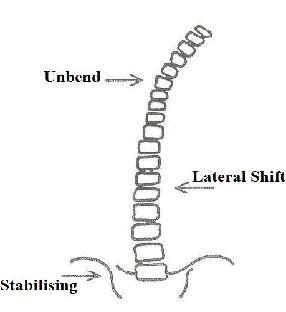 The unbending force is applied to the axillar region on the concave side of the lumbar curve (figure 3.11b). Figure 3.11a and b Correction forces for the King type I pattern. a) A stabilising force is applied to the pelvis on the concave side of the lumbar curve. The lateral shift force is applied to the apex of the lumbar curve. 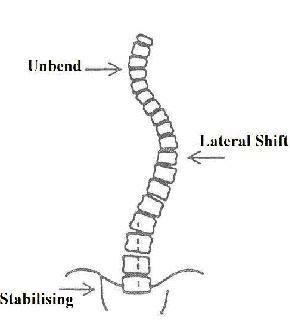 b) The unbending force is applied to the axillar region on the concave side of the lumbar curve, as a result the coronal plane curve is corrected. In the King type II scoliosis the VTA of L3, L4 and L5 are measured. If the VTA is greater than 10 degrees thus a stabilising force is applied to the apex of the convex side of the lumbar curve. 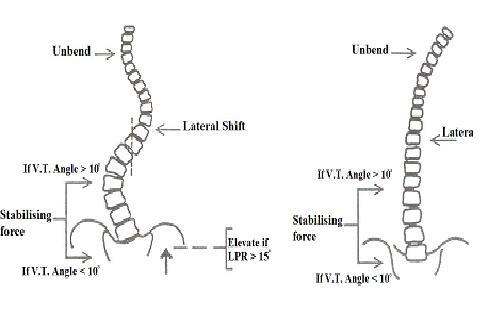 However, if the VTA is less than 10 degrees therefore the stabilising force is applied to the area of the great trochanter on the convex side of the lumbar curve. In the case that the LPR is greater than 15 degrees, therefore a lift must be added to rise the pelvis of the concave side of the lumbar curve (Reed and Price, 2002). As a result, this would align the vertebral column in the lumbar region (figure 3.12a). The lateral shift force is applied to the apex of the thoracic curve (figure 3.12a). Subsequently, the unbending force is applied to the axillar region on the concave side of the thoracic curve (figure 3.12b). Figure 3.12a and b Correction forces for the King type II pattern. a) A stabilising force is applied to the pelvis on the convex side of the lumbar curve or the apex on the convex side of the lumbar curve. The lateral shift force is applied to the apex of the thoracic curve. 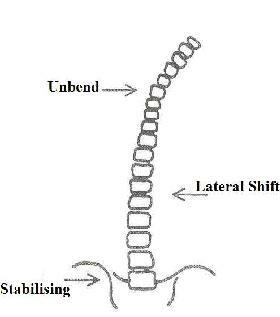 b) The unbending force is applied to the axillar region on the concave side of the thoracic curve. In the King type III scoliosis the LPR and VTA of L3, L4 and L5 are measured. In the case that the LPR is greater than 15 degrees, then a lift must be added to rise the pelvis of the concave side of the lumbar curve. As a result, this would align the vertebral column in the lumbar region. The stabilising force is applied to the pelvis on the concave side of the thoracic curve and the lateral shift is applied to the apex of the thoracic curve (figure 3.13a). The unbending force is applied to the axillar region on the concave side of the thoracic curve in figure 3.13b, (Reed and Price, 2002). Figure 3.13a and b Correction forces for the King type III pattern. a) A stabilising force is applied to the pelvis on the concave side of the thoracic curve. The lateral shift force is applied to the apex of the thoracic curve. 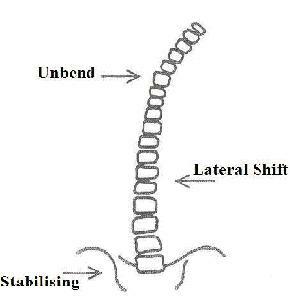 b) The unbending force is applied to the axillar region on the concave side of the thoracic curve. In the King type IV scoliosis the LPR and VT of L3, L4 and L5 are not required. The stabilising force is applied to the pelvis on the concave side of the thoracic curve and the lateral shift is applied to the apex of the thoracic curve (figure 3.14a). The unbending force is applied to the axillar region on the concave side of the thoracic curve in figure 3.14b, (Reed and Price, 2002). Figure 3.14a and b Correction forces for the King type IV pattern. a) A stabilising force is applied to the pelvis on the concave side of the thoracic curve. The lateral shift force is applied to the apex of the thoracic curve. 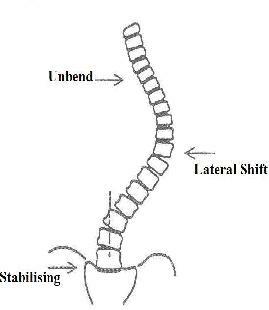 b) The unbending force is applied to the axillar region on the concave side of the thoracic curve. In the King type V scoliosis the LPR and VTA of L3, L4 and L5 are not required. The stabilising force is applied to the pelvis on the concave side of the thoracic curve and the lateral shift is applied to the apex of the thoracic curve (figure 3.15a). The unbending force is applied to the axillar region on the concave side of the thoracic curve in figure 3.15b, (Reed and Price, 2002). Figure 3.15a and b Correction forces for the King type V pattern. a) A stabilising force is applied to the pelvis on the concave side of the thoracic curve. The lateral shift force is applied to the apex of the thoracic curve. 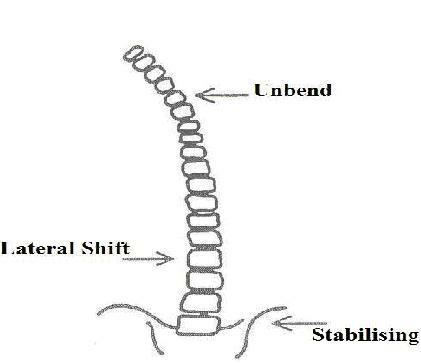 b) The unbending force is applied to the axillar region on the concave side of the thoracic curve.